Doncaster Knights’ decision to keep faith with director of rugby Clive Griffiths during the darkest hours of last season continues to pay dividends. 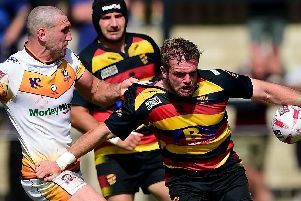 Not only did the Welshman subsequently steer Knights, who risked being dragged into the relegation dogfight at the start of the year, to safety with over 20 points to spare, he also master-minded their run to the final of the B&I Cup final. Although he endured a few anxious moments during a run of nine consecutive league defeats, Griffiths was always confident that Knights would avoid an immediate return to National One and that he would keep his job in his second spell at Castle Park. “Rugby union clubs seem more tolerant of their coaches than a lot of, for instance, football clubs, and seem to show more common sense,” he said. “I know what the situation was like when I walked back in through the door three years ago. The club was bottom of the Championship and I looked at the group of players we had and it didn’t represent Doncaster in my opinion. “I know (some) people expected instant success but I’m not a magician and it took a long time to weed out players I didn’t think had the Doncaster ethos at heart. “We put a game-plan together and we started to build a team bit by bit and we’re heading in the right direction but the jigsaw still isn’t complete and we still need a few more pieces. “But off the field we are in a much better state (than when I took over) and on the field we are getting there, and there is no reason why we can’t emulate what we achieved back in 2006-07 when we finished third.